Float High is a development of the Float sofa. Unlike the Float sofa with its low frame, the Float High is carried by slender steel legs, which elevates it gracefully from the floor. With the two Float sofa’s; Float and Float High, it is possible to pick the one that is the perfect fit for each customer, but they still get the same look of a soothing and strong lounge sofa. The added height, that is gained with Float High, offers a lounge sofa that is not too low. An ultra-low lounge sofa that invites you to sit down, relax and float, is now a part of the Eilersen Family. Combine it in any way so that it is perfect for you and your family. “What is so unique about the Float sofa, is that it is extremely low but at the same time it possesses the best comfort,” explains Designer Jens Juul Eilersen. With sixteen different table tops to choose between, Nils Juul Eilersen wanted to emphasize the beauty and versatility of the multitude of table tops that Eilersen has to offer. With the design of the new Frame table, Nils succeeded in doing just that. A simple frame to elevate the table top of your dreams. Together with Yuzuru Nishiyama from Japan, Eilersen has created a new collection of tables called ‘Kant’. The collection spans from coffee tables in different sizes to the perfect console table or office desk, which even comes with a matching bench. With Kant a new modern classic is born. The High Point Market this Spring will take place April 14th. – 18th. You will find us in the new showroom at 220 Elm, Space 326. We are going to bring many beautiful sofas to this show! You can find Great Pampas corner group in the new fabric Plindy and one more in the new depth and in the new fabric Plakar. There will be a Rig corner group in the new fabric Plindy as well as a Playground in the new fabric Plindy. You can find Ash, Ajour, Butterfly, Tub sofa, Dacapo corner group and Gotham corner group just to mention some more. If this haven't woken up your curiosity, you can see IW dining chairs, Mandarin chairs both sizes, Spider tables and Carpets too! There will be additional models which are available from our quick ship program. Drop is Eilersen's latest interpretation of the classic corner sofa. The seat is low and wide to ensure optimum comfort; and even though the sofa invites hours of relaxation, extra foam with fibrefill has been added to the seat cushions to ensure that you are able to get up again without any trouble. The short, concealed legs create an optical illusion, which makes it appear as though Drop is floating surreally a few centimetres above the living room floor. But don’t worry. As with all other Eilersen models, the sofa has its feet planted firmly in a handwork tradition where aesthetics and practical experience don’t serve to contradict, but are prerequisites. It is therefore nothing less than contemplated proportionality combined with uncompromising choices of material that hold Drop together and ensure the tight look that has become synonymous with Eilersen. Session is the latest addition from Eilersen, who has once again created a sofa for the most discerning of audiences. The construction is supported by slim legs made of brushed stainless steel, which achieves the familiar ambition of completing the shape through functionality. Industry connoisseurs will probably not be surprised by the simplicity that is met by even the most volatile of eyes when they see the Session sofa, which is intended to have a central location in, e.g. the living room, lobby or hall. Its sculptural aesthetics come into full being when standing alone, but make no mistake: Session is a safe haven, not a delicate sculpture. As with all of Eilersen’s sofas, it is designed, produced and assembled to withstand the wear that occurs naturally at a popular place for relaxation and rest. It doesn’t exactly float in the air, but almost. Eilersen’s newly developed Slimline sofa is distinguished by its lightweight appearance. The perfectly proportioned interaction between the steel frame, back, ends and cushions prompts the sofa to defy gravity. Slimline is a classic expression for the values that have characterised the well-known Eilersen brand since the beginning of 1895, when it wasn’t sofas but coaches that bore the signature of the family business. The furniture is therefore a manifestation of elegance, durability and quality. Traditions exist to be renewed and it is therefore a pleasure for the eyes, small of the back and back that the renowned design principles live proudly on in a modern sofa, which in all probability could not have been made a gram lighter than it is. Slope is the name of Eilersen’s contemporary interpretation of the renowned box sofa. The ambition was to create a modular sofa that was so slim it would be almost impossible to manufacture. The symmetry is striking, and Slope fits perfectly in both the classic and modern home. Don’t expect any hidden surprises. With Slope, what you see is what you get: A sofa with tight lines and soft cushions inviting thousands of relaxing moments. This is partly due to the proportions between the seat height, depth and back height being the result of zealous calculations and many years of experience in furniture art. It is also partly due to the fact that all of the materials have been carefully selected to ensure the optimum experience. Not only for those who have received an invitation to sit on the cushions - but also for those who would like to view it as a work of art in the living room, office or entrance hall. Stockholm Furniture Fair. Find us at Stand A16:12! Nils Juul Eilersen will hold a personal presentation on 7th February, at 12:30. We have 4 new Eilersen sofas to present: Session, Slim Line, Drop and Slope. Beside the new sofas you can find our new IW5 chair, as well as the new carpets Lama and Field. Desert, Gravel, Plindy, Plakar, and showing new colours for the existing Pierre fabric. Jens Juul Eilersen has designed a new sofa for Eilersen. A sofa that represents joy, comfort, quality and functionality. This new classic sofa, with its tight look, is called Ash, and goes well with small leather or fabric cushions. A sofa with a timeless expression. Ash is extremely comfortable because it isn't just a sofa - it also doubles as a spare bed. To this end, Jens Juul Eilersen focused on maximum comfort in the seat cushions, so you can feel as well-rested as if you were in a real bed. For more than 50 years, Jens Juul Eilersen has contributed towards improving the comfort and aesthetics of the home. And now he's back again, combining these two concepts and designing a sofa with dual functionality - a sofa and bed in one. During March 19th to 22nd 2017, Mexarts associated with Shenzhen Furniture Association again held an International Lifestyle Design Fair in the third pavilion of Shenzhen convention center. As one of the co-organizer, Mexarts invited many world-class furniture and home furnishing brands to participate the fair with the concept of delivering the beauty and high-quality lifestyle, aiming at presenting a spectacular furniture feast with global standard. The fair was themed with "Encounter the World's Best Home in Shenzhen", as the second cooperation between Mexarts and Shenzhen Furniture Association after last year "Danish Lifestyle Design Fair". Add on to last year Danish premium furniture brands, Mexarts this year integrated with high-end furniture designing brands from Sweden, Netherlands, Belgium, etc to join this fair. This was the first time for Eilersen brand to be displayed in scale in China Furniture Fair. Mexarts granted 300 sqm for Eilersen to build up an independent brand area to present 13 sofa models. This area became the most comfortable area in the fair with 13 beautiful models to create a both elegant and comfortable experience. Eilersen is renowned for its comfortable furniture. Furniture that helps you enjoy your time off and lets the family relax. Now, Eilersen is launching a collection consisting of two- and three-seater sofas that come with an armchair. Butterfly is designed around a delicate frame with down-filled seat and back cushions and armrests. This new model is called Butterfly. Eilersen cannot take full credit for the Butterfly concept. Butterfly was conceived and sketched by Japanese designer Yuzuru Nishiyama, in collaboration with Jens Juul Eilersen. The idea behind Butterfly was to create a sofa that balances the formal and the informal. Butterfly has two expressions. From the back, it appears slim, minimalistic and quite formal, whereas from the front its look is dominated by the soft, down-filled cushions with visible stitching. These stitches give Butterfly a softer look, with a Bohemian touch. With its tall cushions, the sofa is the best and most convenient place in your home to rest or just sit and chat. With its slim body and slender, stainless steel legs, Butterfly is a light sofa, perfectly suited for smaller living rooms or as a soft touch in the dining room. Press release: Model SafariThe Safari chair is back! Which chair best compliments Eilersen's vast collection of sofas? That is a question that has often been debated by the Eilersen family. Now the answer has been found, and the selected chair is the Safari chair by the Danish furniture designer Erik Woertz (1916-1997), which will be relaunched in five combinations at this year's design fair in Stockholm . The reason is as simple as the chair's styling: The Safari chair's slender lines afford the optimum contrast to a large sofa. As important as it is for Eilersen's customers to think creatively and personally when selecting the modules and fabrics for their new sofa, it is equally important to think classically when they choose their Safari Chair. Eilersen kicks off 2017 by introducing a collection of three organic sofa tables, available in marble. A collection where both the tabletop and legs can be combined, and where the tables can be used either as nesting tables or individually, thanks to their different sizes. Jens Juul Eilersen designed this new collection which he named Island, since the tables can be used as decorative islands amid soft décor. Press release: Model BermudaEilersen's new sofa is a chameleon. The Bermuda is Eilersen's new sofa offering. Its classic lines will suit any interior, and its classic cut provides a multitude of upholstery options. The Bermuda will be presented at this year's furniture fair in Stockholm as a chameleon. Its fabric colours, textures and composition make it easy to adapt it to any interior or home. The sofa will be available from Eilersen's international network of retailers. 15 years ago, Jens Juul Eilersen, designed the Baseline couch. With its depth, broad armrests and excellent comfort, it became one of Eilersen's greatest successes. Jens Juul Eilersen has returned to his drawing table and reinterpreted the sofa which gained the Eilersen brand international recognition. Illum Wikkelsø designed No. 4 with stringent lines and with function in mind. It combines Eilersen's expertise on wood and upholstery in one piece of furniture. The result is an honest chair, which Wikkelsø has refined with very few accoutrements, so that its great seating comfort matches the artistic vision. The chair's base consists of a solid wooden frame of oiled, black-lacquered and soaped oak, and the architect has afforded the No. 4 extra support with a slight slope in the back and seat. Wikkelsø decided to have the frame continue elegantly up through the arm, breaking the clean lines and giving the armchair a subtle finesse. The Joy is a development of a daybed, with a wider seat and with the option of creating more positions with optional cushions. Jens Juul Eilersen has designed a sofa that can change its appearance and function depending on the needs and number of persons sitting on it. And the ambition has been to go all out in terms of flexibility. It can therefore be placed along a wall or as a sculpture in the middle of the room. Eilersen is not only known for its sofas, but also for its vast selection of special cushions, specially sewn for extra comfort and flexibility. Neck bolsters and cushions of different shapes and sizes share the common feature of allowing you to sit, lie or throw back on the wide sofa. Eilersen has been on a new mission to Japan. The trip resulted in a collaborative sofa, which is both Danish and international, while remaining rooted in the famous Japanese simplicity. Its name is Mission, and the couch is a slightly lighter version of Eilersen's well-known sofas. The Mission is designed to underpin and cultivate the Japanese tradition of simplicity and harmony, in which the lines do not interfere with the design but rather enhance its function. With its stringent body, slender legs and eye for detail, the Mission positively floats and promotes itself as the perfect sofa for a simple interior design. Eilersen har doneret to IW3 gyngestole til Dansk Flygtningehjælps online velgørenshedsauktion 2015. I følge Dansk Flygtningehjælp indbragte auktionen over 200.000 kroner. Pengene fra auktionen går ubeskåret til nødhjælpsarbejde i verdens brændpunkter. IW2 and IW3 are the names of both a dining table and a rocking chair, designed in 1958 by the Danish furniture architect Kristian Illum Wikkelsø. This chair's comfort and the countless possibilities it represents for painting in a vast array of shades, made it the perfect choice. Eilersen decided to spray-coat the IW2 and IW3 in eight colours from the graphic shades between white and black and in matte pastels. The simple expression of form inherent to these chairs and their straightforward design means they will match any interior, table or sofa. "Classic, tight lines create a sense of rest. It's pleasing to look at, and creates a lasting impression that never goes out of style. Bridge has inherited all the proud qualities of the traditional floater sofa, along with discrete, classic flair to keep it modern. One special feature is that the sofa can easily glide across the floor on its low-profile, 2 cm legs. This presented both a design challenge and the inspiration for the name Bridge. A sofa without legs is subject to kicks and marking from shoes. So I designed a recess to take the lower edge out of the danger zone of kicks and bumps. And it was this very recess that made the sofa resemble a bridge", explains Eilersen. "The Great Gatsby" is first and foremost the title of a legendary novel that was later turned into a film, eventually turning "Gatsby" into a lifestyle concept. Gatsby stands for high class. Easy living. Colours and celebration. And the slightly advanced, but much studied sense of taste. Is this a fit for you? Then so is Gatsby. Jazz is the answer to your need to add swagger to a small room, where you don't want to compromise on design, comfort or functionality. With reduced dimensions and maximised functions, you can use it as you like. "Something highly non-traditional and unique is the fact that Jazz has a removable back", explains Jens Juul Eilersen. "By taking the back off, you can use the sofa's entire depth. And just like that - you have a guest bed or a sleeper sofa. Without having to pull the sofa out. Without taking up much space. And without making you roll to one side, since the sofa has no seat gradient". With Penthouse, Morten Voss thought outside the box. Quite literally. The new shelf that he designed for N. Eilersen A/S completely does away with the traditional shelf box. The idea was to create a personal Random Room, where the visual impression takes root in the soul of the room. Realise your dream of a penthouse apartment - at home in your living room. Penthouse is cosmopolitan lifestyle furniture that longs to be seen, heard and noticed, as it touches on all the senses. "My aim was to create a Random Room that provides new experiences, inspirations and sensory impressions nearly every day. Penthouse is not merely functional furniture: it is a sculpture. Built to be admired, over and over again, because Penthouse will always have new stories to tell." It started out with an informal meeting in Milan and ended with an approved design from Buenos Aires. In brief, this is the story behind EILERSEN's new lounge chair, the STRING, designed by Argentine designer Federico Churba. Federico Churba was trained as an industrial designer at the University of Buenos Aires and currently runs his own studio, where he designs furniture, lighting and home accessories. STRING's design is based on the concept that the more comprehensively planned out a design is, the more extensive its range of possible uses and applications. With this in mind, Federico Churbas envisioned and designed the STRING in two versions - one for indoor use and one for outdoor use. Dansk Flygtninge Hjælp afholder auktion på Lauritz.com. Eilersen har doneret en Control stol til formået. Auktionen på Lauritz.com afholdes den fra den 13.-23. juni 2014 og det konkrete mål er, at samle penge ind til nødhjælp og beskyttelse til børn på flugt i bl.a. den Central Afrikanske Republik, Syd-sudan og Syrien. Da det er en kæmpe opgave at skaffe nødhjælp til flygtningebørnene, er der et enormt behov for virksomheder, der har lyst til at gøre en forskel. Enhver donation til auktionen gør en helt konkret forskel i børnenes liv. For kr. 5.000,- kan Dansk Flygtningehjælp f.eks. levere vanddunke og sæbe til 76 børn i den Central Afrikanske Republik. The contemporary design installation to be housed in the Western foyer of the Sydney Opera House opens on 25 October 2013. Bang & Olufsen, BODUM, Cane-line, ECCO, ege, Eilersen, Fritz Hansen, FLEYE, Georg Jensen, Grundfos, HAY, LEGO, Lightyears, LINDBERG, Louis Poulsen, Nordisk, Novo Nordisk, Ole Lynggaard Copenhagen, Onecollection, Kay Bojesen, Paustian, Scanpan, Steensen Varming, Viola Sky and VisitDenmark. The saying says it all. This is an Eilersen. But does Block form part of the collection of lounging sofas? Or is one on its own? Jens Juul Eilersen called Block a primal sofa as its simplicity takes you on a journey in time back to basics. It is so simple it is almost advanced. As the market and people in general have become accustomed to a cornucopia of designs, details and frills, the first impression of Block is one of surprise. And it may also give rise to curiosity after finding out why it gives peace of mind. Why the eyes don't tire of it. Why it is just right - without making a fuss about itself. A lounging sofa from Eilersen promises comfort. Comfort with no compromises. 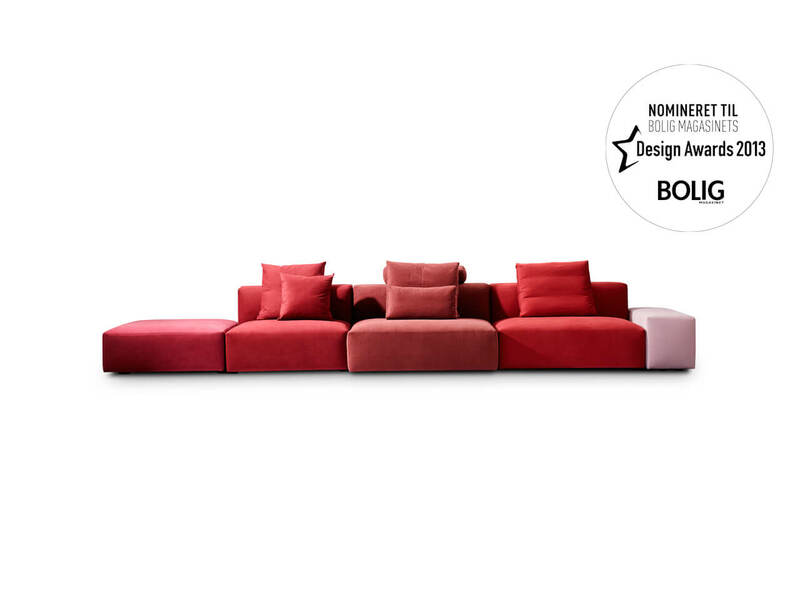 In strong, well-conceived lines and with soft upholstery that hugs the body. But how can this be harmonised and balance with the desire for lightness of expression? "Savanna is built up as a normal frame with normal seat cushions. On the face of it this sounds firm and this was just my intention" emphasises Jens Juul Eilersen. "I wanted to create a sofa with a world of opportunities for expansion and a design which is so classic that the sofa will always modern. Taut lines are good for the eye but the sofa must also be really great to sit and lounge in. The art was to optimise the comfort without compromising on the lightness. Press Release: 3D Model BaselineNow you can build your own Eilersen sofa! Download the new Eilersen 3D app from Apple store and build you own sofa at home on your iPAD. A world of possibilities will open up your imagination and let you design or build the sofa of your dreams. Change in a second the fabric or leather of your choice - or the choice of your family, and add your creation of sofa into a picture of your living room. LIVING HOME is the future Danish holiday home. An environmentally friendly and energy efficient house full of Danish interior design products presented in a manner that corresponds to the Danish way of living. The purpose of LIVING HOME is to show you what a vacation in a Danish holiday home might look like, and to show you some examples of Danish design and lifestyle products. Auktionen kommer til at foregå fra den 19. marts til den 2. april. Pengene fra auktionen kommer til at gå til det arbejde vi laver i Landsforeningen Autisme. Landsforeningen Autisme arbejder for at forbedre forholdene for børn, unge og voksne med autisme. Meget handler om at gøre handicappet forståeligt for andre, både pårørende og fagpersoner, men også den danske befolkning generelt. Dette gøres gennem kurser og telefonisk rådgivning. Eilersen is proud to announce that we were appointed Supplier of Year 2011 by Actus Corporation, Japan. The appointment is based on the total sales through Actus Corporation, development in sales in 2011 through Actus Corporation, our company operational set-up and execution, and our design and quality of products. We are very thankful for this great honor, and we look forward to serve Actus Corporation, their very skilled and dedicated team and cooperators, and their customers in 2012. Great Pampas is an extravagant version of the Pampas. The new edition has been given a broader back and armrests that can better keep track of all the cushions and the seat has been upgraded from foam and fibrefill to Eilersen's famous down-top. It provides even more comfort - and an even greater feeling of ultimate luxury. "The whole secret behind RIG's style and unique comfort is that I have combined a high, slim back with a seat drop in the actual frame. The higher the back, the greater the seating comfort. But a high back can steal the focus and make the sofa lose its optical balance. Which is why I have deceived the eye. My starting point is a back, which with its 66cm, is pretty high. In fact, it's a whole 5 cm higher than the other cousins RIG can be compared to in our sofa family. On the other hand, the back has been slimmed down to just 18 cm. I camouflaged the high back's optical weight with a horizontal seat, which makes the back and seat fuse together into a harmonious unity. A strong, built-in drop in the seat in the frame also ensures that you do not slide down the sofa, and combined with the frame's foam padding, the great seat depth and our renowned down top makes it uniquely comfortable to sit in with extremely good support in the lumbar and back area. So RIG keeps its shape, keeps you comfortable - and snuggles warmly around you with its soft down." "The actual shape of the table is inspired by the wing of an aircraft" says Monica Ritterband. "An airplane wing is carried by air. It looks light. It is long, elegant and strong. It has a tight and highly accurate aerodynamic design. It has strength and character. Nothing is left to chance, and it lives up to its mission 100%. Unaffected and effortlessly it carries its load - up into the sky," she explains. Airborne can also lift anything to heavenly heights. As the dinner table in a modern home. As a coffee table in the lounge corner of the living room or in the company's informal conversation corner. As a meeting or canteen table. Simplicity combined with sophisticated details is the strength that makes Airborne able to fly in and match any environment without compromise. Airborne will always be itself and have its own importance. But the table also has respect for its surroundings and slides quite naturally into the context. "In reality, Flap is classic box furniture with a slender back, thin arms and lots of cushions. The kind that has been seen before. But - what is well-known also delivers. Flap is much deeper than the box-sofas we have seen earlier in the Eilersen catalogue, and then it has the 1 centimetre wide flaps everywhere. Not just on the cushions, but also on the frame. It gives Flap a consummate audacity and a touch of Bohemian luxury" emphasizes Jens Juul Eilersen. "My idea was to design a Scandinavian sofa, which was a little more carefree; and that provided the inspiration for the flaps." Karma lounge and CFM06 is the leading element in the decoration of the set, in the new Brian Mørk show. The host Brian Mørk, is famous from several other talk shows. The show will be broadcasted in the spring 2011. We have in cooperation with Kunde & Co developed our new website. We are very proud of the result, and very proud of the website has been nominated as one of three best, in the category "Best Branding Website", in this years Creative Circle Award. Creative Circle Award is the most acknowledged award for creative communication. The reward cherishes creative communication and good design, which raises the top bar in the Danish advertising business. Eilersen is part of one the most spectacular new house building projects in Denmark. The low energy, or rather +energy house, is developed by Teknologisk Institut. A house which produces more energy than it use for heating, is ready for moving into, in Taastrup just outside of Copenhagen. The project is called EnergyFlex, and Eilersen has joined the project by furnishing the livingroom with a baseline sofa. The main goal of the project is to reduce the CO2 output in Denmark. Karma lounge is the first guest in the new talk show "Who knows who?" Karma lounge is the leading element in the decoration of the set, in the new talkshow "Who knows who?" The host is Peter Kjaer, who is famous from several other talk- and quiz shows. The show will be broadcasted in the spring 2010. Giga's body is composed of a thin, cosy seat of 130 x 210cm. Giga gets its cosy look from two ways. First and foremost, the seat is made of Eilersen's well-known down surface which moulds itself to your body but springs back again as soon as you give your sofa a few pats with your palm. Then there is the fabric. It is fitted loosely and roughly to give it a slightly more relaxed feeling. The removable backs are solid moulded foam and are also angled so that they curve around you and give extra support. The combination of the low foam back and the soft, 50cm high, down pillow gives it perfect support and comfort. The mega-sized sofa-playground with cushions floats on 14cm round steel legs. Pampas can, will and dares do it all. "What is unique is that the sofa is not locked by fixed arm- and back cushions all around it. Instead, the Pampas has shaped, loose, removable back cushions in foam. This means that you can lounge across it - or move the back, so you can lounge along the length of it. Just lounge in any way you wish to," explains Jens Eilersen. Moving the back not only creates more possibilities for use, but also gives the sofa a totally different feeling. "My plan was to design the sofa as deep as possible, but not everyone is almost two metres tall like me, so I ended up creating the Pampas in two depths of 115 and 105cm. When the back cushions are moved to the end of the sofa, a large surface is created, which gives a feeling of being even deeper. " Plano stands and floats on round, 14cm high steel legs that are in keeping with the same light tone. The back and armrest are only 7cm wide and almost seem to have the style of a folded plate that is thin and light, yet still strong enough to be the base for a sofa lounge. The most essential factor of the sofa's functionality is the removable, shaped foam back cushions. They are available from 70 to 120cm with a 10cm spring - six sizes in all - and you can move them freely around as necessary, depending on whether you want to relax lying across it in front of the TV or relax lying down with a book. Plano's seats are equally flexible. You can buy them with a spring of 10cm from 140 to 240cm - that is 11 sizes in all, which are available in both right and left hand versions. Therefore, Plano fits any room regardless of size, which is particularly suited to Scandinavian homes with their relatively small, cosy rooms. Plano is 100cm deep, and the flat, sleek and lightweight design is emphasised by the foam and fibre filled seats, which gives the sofa strength and rigidity. Soft down filled pillows ensure that the look is cosy without being heavy. Plano works perfectly as a single chaise longue, but you can also buy Plano as a finished sofa with two armrests with a total length of either 230 or 240cm. Some want to float. Others want to sit. A sofa is often either-or, but this is not the case with Cocoon. It allows you to choose both. "My idea was to develop a sofa that gives support all the way around. Just like a cocoon, hence the name. I knew at once that the back should be high to give maximum support and seating comfort. And whilst I was considering how it must feel to be a silkworm larva, spinning its silk, the image arose of a gigantic toy box. That was the solution! A gigantic toy box with triangular cushions, lumbar cushions, pillows, arm supports, neck cushions - cushions in all sorts of sizes and forms. This method allows you to determine the degree of comfort yourself, and at the same time be able to have great fun building and being in the sofa." A new collaboration between Eilersen and Morten Voss. Over 100 years of Eilersen's proud traditions are merged with the greatest breakthrough in recent times. Morten Voss travelled a completely new road when in 1994 he launched his first groundbreaking furniture range. "We are very enthusiastic about the premiere of our collaboration because our goal is still to base our furniture on original craft traditions and newly created design," stresses Nils Eilersen. "Such a super, organic under-frame that it's almost irritating," says Morten Voss about Waikiki, which gets under your skin just like the famous beach in Honolulu after which it is named. "Organic forms have a fantastically strong appeal and attraction. Waikiki works like an attention magnet and, at one level, one almost enters into a symbiosis with the table that makes it difficult to look away," says the designer. The under-frame is combined of two "dressing bricks", which can be arranged to create two different appearances. The frame is available in black and white and combines with glass sheets to create a full image of the beach's light. "Karma consists of a lounge chair, a conference chair and a conference table. Our aim is to give designers many strengths to play on, so they have the potential to create a unique and individual collaboration between furniture, architecture, the interior and the business's identity," explains Nils Juul Eilersen. "In the Karma series, Eilersen's renowned quality is matched by C.F. Møller's great insight into the contract market. We previously launched CFM06, which was intended for large spaces such as foyers, reception rooms or other major traffic areas. Now we are intending to provide good karma for business meetings and, on the basis of our thorough analysis of the market, target groups and competitors, we are sure that we have 'hit the bull's eye'," stresses Nils Juul Eilersen. "Sheep has been slightly rounded on purpose," says Jens Juul Eilersen. He elaborates, "My aim was to design a soft version in the flock of floating sofas and Sheep is the flock's soft ewe. The great challenge with soft, upholstered furniture is durability because it's no use if the sofa is squashed flat in just a few days. I have therefore focused on the sofa being both comfortable and durable. Sheep is upholstered in soft foam and there is a good 600 grams of fibre filled into all areas on top of that, resulting in a 'sheep in fibre's clothing'. It makes it round, soft, comfortable - and simultaneously very simple. Like a woman, a sofa must have a little filling, and Sheep has both a full, soft appearance whilst being very soft to sit on." Did you cuddle your pillow this morning? "My idea was to create a sofa that you could cuddle in the same way as a down-filled pillow. When you cuddle it, it's soft and takes the form of your hands, arm and head. You immediately let it go and give it a few slaps, it rises and takes its original form again. Soft Ice functions in precisely the same way," says Jens Juul Eilersen, who stresses that the varying and sensitive anatomy the sofa thus obtains, is absolutely intentional. "Some sofas have a strict idiom, and exist like a sharp-edged sculpture in the room. Soft Ice is looser and more relaxed. When you sink down into it, it takes the form of your body and therefore has a constantly new, individual appearance, which is a mirror of your way of using the sofa."